Click on any picture or link to see a large-sized image. You should have 5 "wither tracing" type templates, and 1 long "rocker" template. You'll also need a piece of chalk. Turn the saddle upside down and feel for the bars of the tree. Find the burr (round area at the front of the bars). Outline the burr in chalk. Put an X in the middle. The rocker strip is placed longwise on the bars. 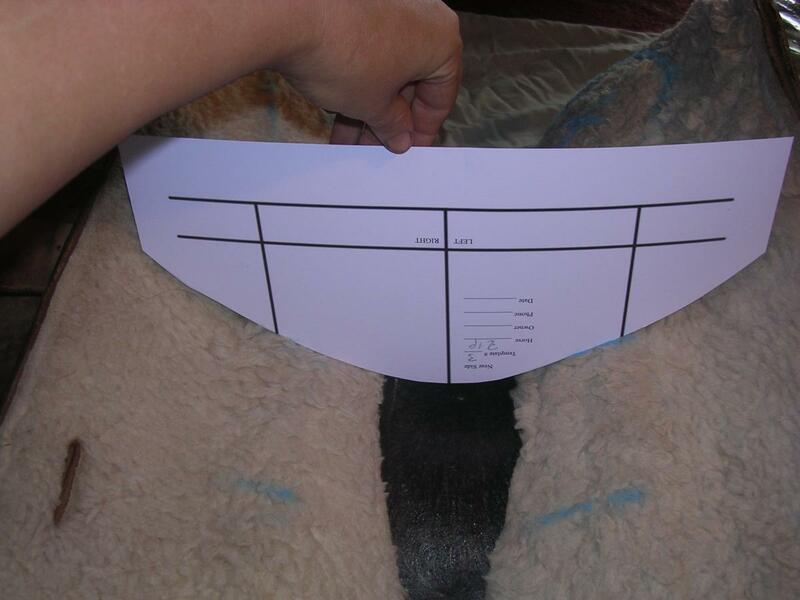 This template is a measurement down the horse's back, from the shoulderblade toward the hip. 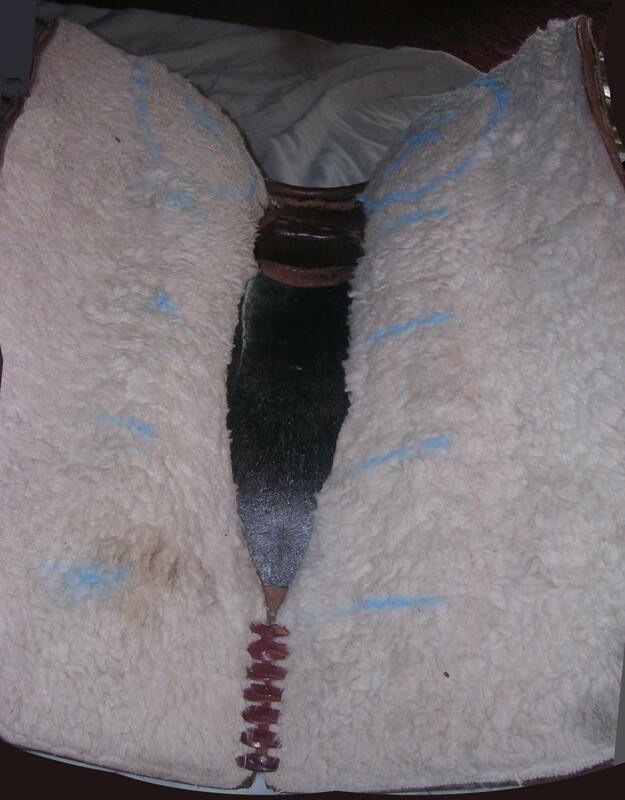 The measurement is taken along the muscle itself, not along the "topline." Compare the long rocker strip to the rocker on the bars. Match up the * on the rocker sheet with the X chalked onto the burr. The rocker should be held so that it goes down the middle of the bar. For a good fit, the rocker should sit against the bar all the way down. There should be no empty space between the rocker paper and the surface of the bar. This picture is close to a good fit, but there is a gap towards the back. This horse's back would be too flat for the curve of this saddle. The saddle would rock forwards & back. It's difficult to hold the rocker paper in place while doing anything else. So lay the rocker paper against the bar. At each tick on the rocker paper, draw a tick (in chalk) on the bar. Check to make sure that your ticks are all drawn correctly; the ticks should line up with the rocker paper when it's held up and aligned down the middle of the bar. Draw the burr, X, and ticks on the other bar in the same way. 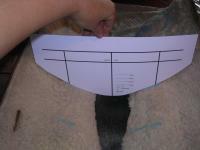 Now we'll examine the templates across the back. Template 1 is a standard "wither template." 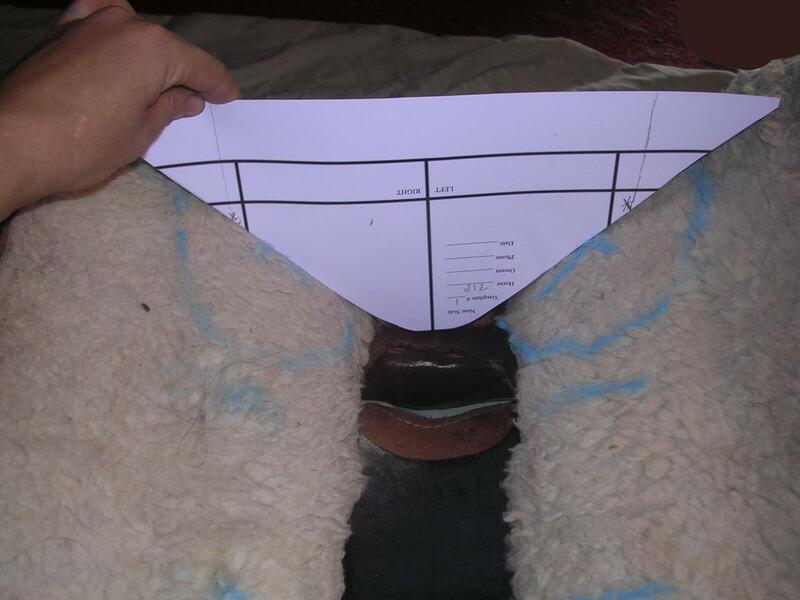 The side marked "left" should be on the saddle's left side; the side of the paper with markings wil be facing toward the cantle. Set the template across the bars of the saddle. Each side should sit across the X on the burr. The center line should point straight down. 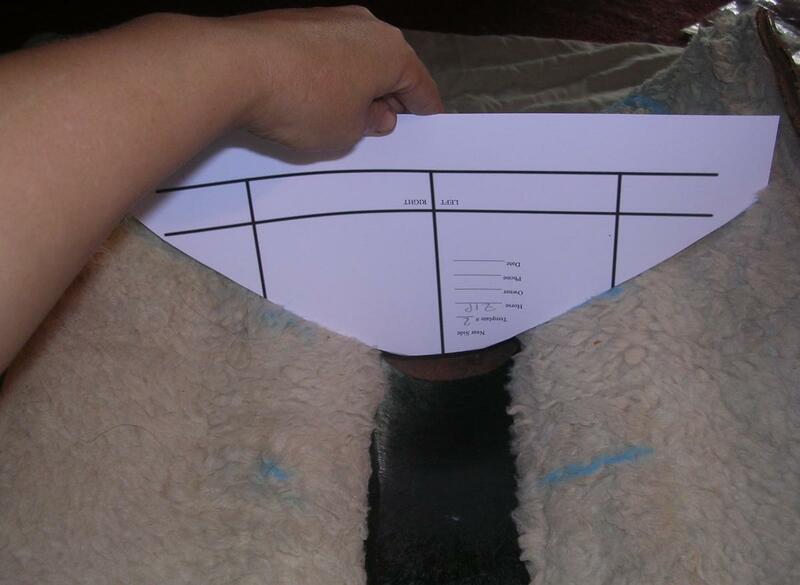 For each of these templates, a "good fit" is determined by the manner in which the template sits across the bar. The template should touch at the center of the bar. 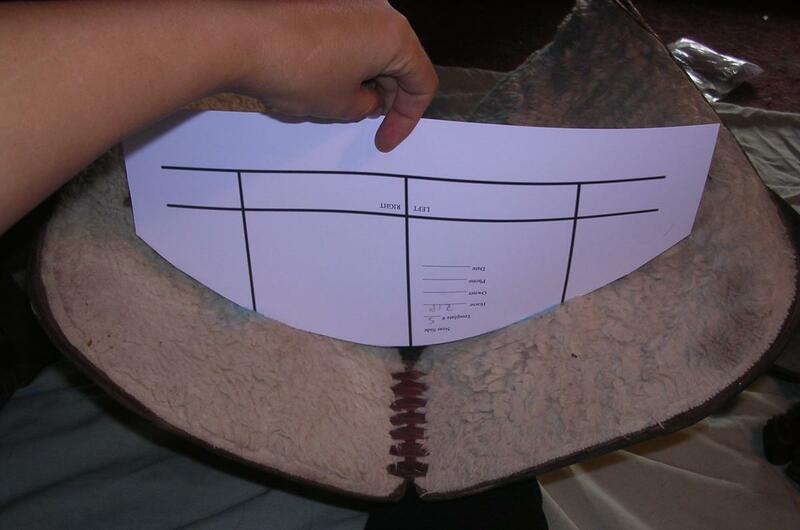 If the template touches closer to the center of the saddle, the bar's angle is too wide. 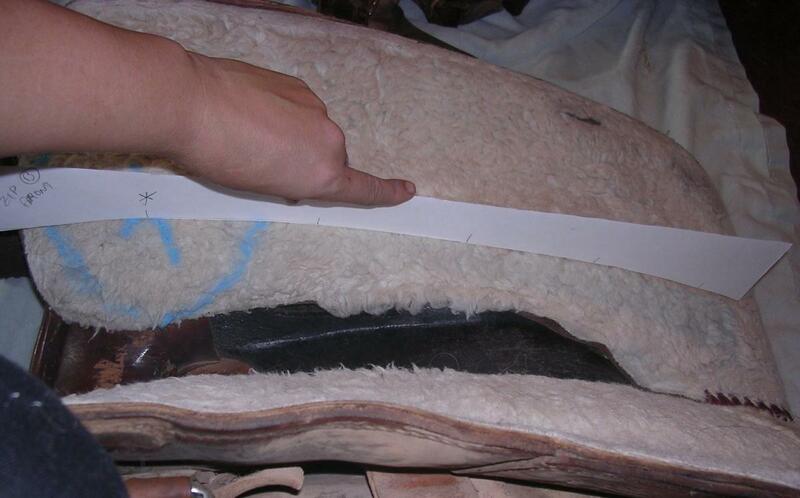 If the template touches closer to the outer edge of the saddle, the bar's angle is too narrow. The surface of the bar should slope evenly away from the template, both above and below. If the surface is closer to the template above or below, then the angle is not right. For template 1, the tick mark on the template should be as close as possible to the X. 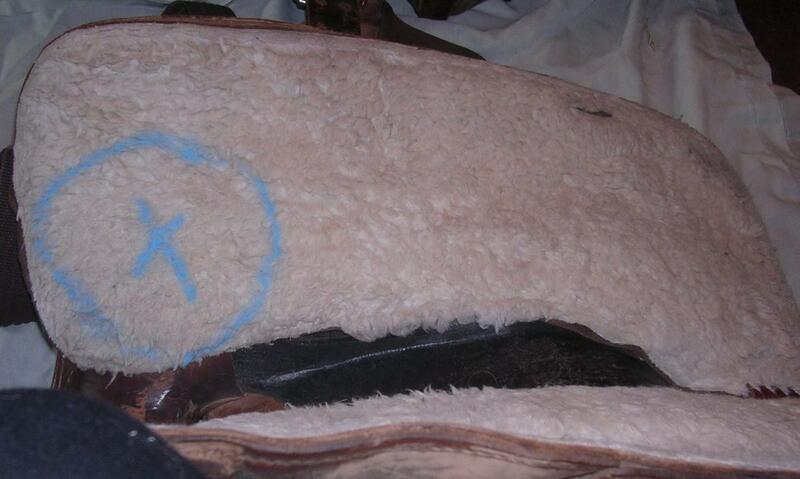 If the X is below the tick mark (toward the center line), then the saddle would sit too far up the horse's shoulder. It will be too close to the spine. The horse needs a wider fork. In this picture, the template does meet the burr at the center, and the burr slopes evenly away from the template both above and below. However, the X is much too far from the * on the template. 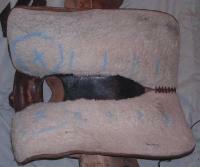 The saddle would sit too high up the shoulder, and too close to the spine. Templates 2 to 5 are similar to the standard "wither template." Template 2 is measured 4" back from the wither template. The side marked "left" should be on the saddle's left side; the side of the paper with markings wil be facing toward the cantle. Set the template across the bars of the saddle. Each side should sit across the first tick on the bar. The center line should point straight down. For templates 2 to 5, the outside line (vertical line 4" to the left or right of the center) on the template should be as close as possible to the middle of the bar. If the middle of the bar is below the outside line (toward the center line), then the saddle will be too close to the spine. This picture shows a good angle. The template does meet the bar at about the middle. The bar above and below looks the same in comparison to the template; however, there is almost no "sloping away"; there's not enough flare toward the edges of the bar. In addition, the outside lines are almost at the outside edges of the bar. At this point along the horse's back, this saddle does not have enough flare along the bar, and would be too close to the spine. Template 3 is measured 4" back from Template 2. Set the template across the bars of the saddle. Each side should sit across the second tick on the bar. The center line should point straight down. For templates 2 to 5, the outside line on the template should be as close as possible to the middle of the bar. If the middle of the bar is below the outside line (toward the center line), then the saddle will be too close to the spine. This picture shows a narrow fit at Template 3. The template touches only the outside edges of the bar. The outside lines are at the outside edge of the bar. The saddle would not sit well on this part of the horse's back at all. Template 4 is measured 4" back from Template 3. Set the template across the bars of the saddle. Each side should sit across the third tick on the bar. The center line should point straight down. 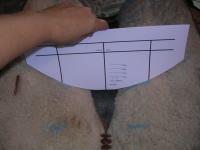 For templates 2 to 5, the outside line on the template should be as close as possible to the middle of the bar. If the middle of the bar is below the outside line (toward the center line), then the saddle will be too close to the spine. This is also a narrow fit, with the template touching only at the outside edges of the bar, and the outside lines at the outside edges of the bar. Template 5 is measured 4" back from Template 4. Set the template across the bars of the saddle. Each side should sit across the fourth tick on the bar. The center line should point straight down.